A while back I needed to save a sound byte from a DVD for a video project I was working on in iMovie. I thought this would be pretty simple but soon found out that it wasn’t. Thinking that QuickTime would surely feature a decent audio recording function, I was frustrated to discover that you had to pay and upgrade to the Pro version for sound recording. In fact, every other package I looked at for recording sound required some kind of payment. Either that, or it would only work with certain sound sources. Then I discovered Audio Hijack Pro and while it’s not free, it does allow you to record up to 10 minutes for free from any sound source. In addition, it looks great, feels and works like a professional sound recording app but doesn’t require a degree in sound engineering to work out how to use it. All the major applications that you might need to record are listed neatly down the right-hand side of the Audio Hijack Pro including RealPlayer, DVD Player and Skype. If your application isn’t listed, you can easily add it using the application selector. The great thing is, you can preview how your recorded sound is going to sound like by clicking “Hijack” when you’re ready. If you hear a high-pitched noise while the audio is being hijacked, it probably means that your gain is too high and you need to lower it. When you are ready, simply hit record and your audio will be recorded in high quality MP3 format. You can see exactly what you’ve recorded in the recording bin where you can also burn your clips directly to disc. 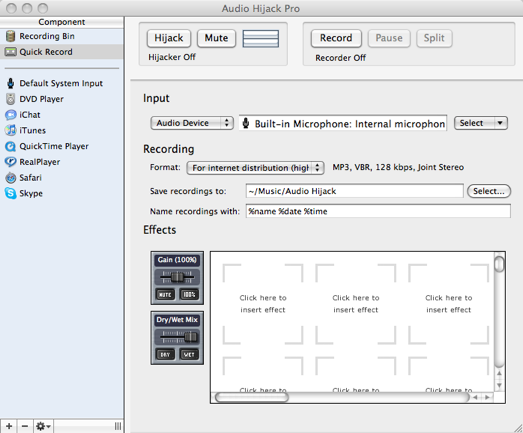 Audio Hijack Pro is definitely the best audio recording application I’ve used on the Mac.You’ve got total control over how much is recorded and you get 10 minutes recording from any source for free. For $32, you can upgrade to record clips as long as you want and I think it’s well worth it.